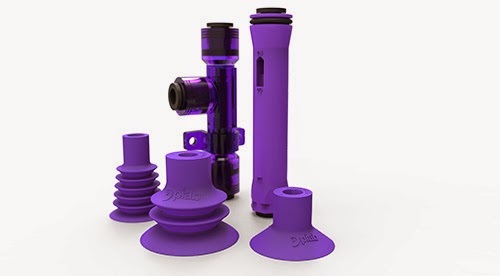 We are proud to introduce Piab’s new Value Line products, comprising of 21 suction cups and 2 small light-weight ejectors. Piab has traditionally focused on developing products and being the market leader in applications that are challenging or demanding from a vacuum performance point-of-view. They are now expanding their focus. The value line is ideal where machine speeds and surfaces to be gripped are less challenging, such as with case/carton erectors. Other examples are equipment for loading/unloading or sorting sheets into metal forming machines (laser cutting, water jet, punching etc.) and parts removal from injection molds. Interested in learning more? Contact your FPE solution specialist or visit the Piab website. This just in from Yamaha - just in time for the show opening. We've taught the YK500TW some new moves and given it a dance floor. Check out the video of our new 360° SCARA demo to be on display for the first time at the AUTOMATE 2015 show in Chicago. See the our Disco Robot LIVE at Automate 2015. At first glance, it was no big deal. I get lots of these. It's a flyer for the upcoming trade show, Automate 2015, taking place at Chicago's McCormick Place next week - March 23-26. 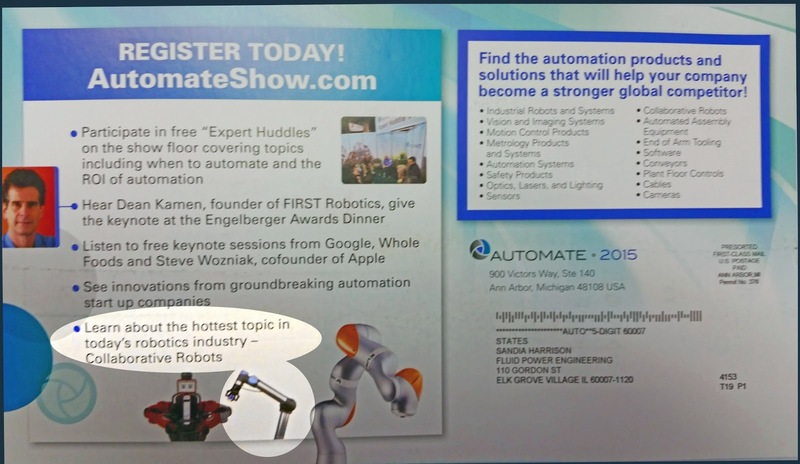 "Learn about the hottest topic in today's robotics industry - Collaborative Robots"
A photo of the Automate 2015 flyer on my desk this morning. The quote from the show organizers is not just hype. Indeed, collaborative robots are arguably one of the most important things going on in industry at the moment. Fluid Power Engineering is proud to be representing Universal Robots. Yesterday, FPE was welcomed as a new distributor in Universal Robots' newsletter. Introducing the MAC PV03 Series Pulse Valve. It's a direct drop-in for existing pulse technology. Designed better. The MAC Valve way. The MAC Pulse Valve series is designed to be a direct drop-in replacement for existing pulsetechnology. The MAC solution utilizes a long life, bonded-spool design, instead of the traditional diaphragm style. MAC also uses a balanced pilot valve that isolates the solenoid from airline contamination. Available with integral solenoid pilot as well as bleed pilot configurations. The MAC Pulse Valve is available with various adapter options. These adapter options allow the MAC valve to directly replace the diaphragm technology with our bonded spool technology without disturbing plumbing. The MAC bleed configuration works with existing remotely located solenoids. An aluminum die-cast body, nitrile seals and an environmentally protected solenoid are standard features. Viton seals are also available for extreme temperature environments and chemical resistance. Lower cost of ownership through reduction in downtime due to high reliability. When necessary, maintenance is simplified with available spool kits. Download the full brochure here (PDF format). Contact your Fluid Power Engineering Solution Specialist for more information.